Part of anger management is to understand why we are angry, and where it is rooted in us mentally and emotionally. We are angry about something, and real problem is rooted deeply. What we usually express, and what others see, of our anger is but the tip of an emotional iceberg, and to lessen or eliminate it, we must have some deep level understanding of why, where and when. Ultimately, our most unmanageable anger is rooted deeper inside us requiring some understanding of how our emotions work, and was initiated by a sense of personal hurt or woundedness, a fear of being hurt again, and a feeling of the unfairness of it all. Expressed another way, it is rooted in pervasive feeling of rejection in the problem area. 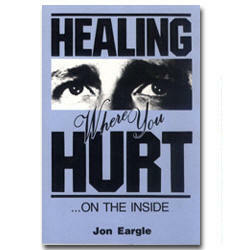 The book, HEALING WHERE YOU HURT -- ON THE INSIDE, deals with these key issues that exist to some degree within each of us. No one is 98.6 emotionally. It is a book that has been used by thousands in over thirty nations to reveal (and heal) how are negative emotions function the way they do, and why. It was birthed out of the abusive childhood of the author, and tested and proven in the lives of thousands over a number of years. The author grew up in a very dysfunctional family where every kind of abuse was present from severe sexual and physical abuse to continuous emotional and verbal assault. He suffered from chronic depression for most of his life, at times walking on the razor's edge of complete despair and suicide. It is a story of victory and overcoming -- of being healed by God and being set free. It is a handbook which shows simply and clearly how you too can be set free in the areas of your "imprisonment" and come to have meaning and purpose for your life. It is a story of God's healing love which sets the captive free.